Extraordinary events always demand new inspirations with exclusive culinary delights. Modern and efficient processes are also implemented as well as in kitchen technology. Due to the given high number of events, reliability was listed top on the list of requirements. On a length of 2900mm and width of 1600mm functionality and design are united in the ranges of Salvis VisionPRO. 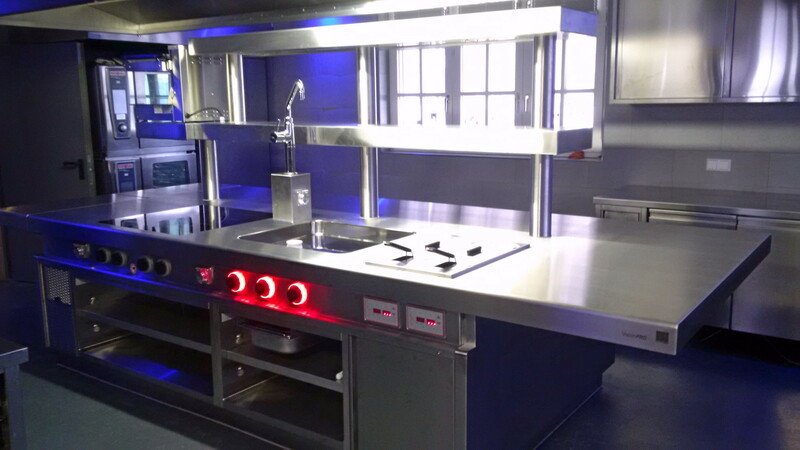 The full-surface induction and the Variogrill 800 ensure that all events run smoothly. "Not to miss the Salamander Salvis Classic with plate detection and HiLight heating system for the last detail in the menu. The furniture in the substructure of the Salvis VisionPRO stove in H2- hygiene design and the seamless and jointless construction of the worktop in one piece support the kitchen team in kitchen hygiene. Salvis relies on the exclusively trained specialist trade partner in the region for its projects. The company Tischer Gastro GmbH from Heidelberg-Leimen coordinated the assembly and takes over regular maintenance before the wedding season. Salvis, with its origins in Switzerland, is considered a pioneer in professional range construction with over 100 years of experience. With the development of the first electric cooker around 1918, the course was clearly set. Nothing stood in the way of the innovation "electric stoves". Today we also act as partners of the chefs with extraordinary ideas. GreenEgg, Smoker, Sousvide basins, freezer drawers and many other components in or on the range are the result. The focus is always on optimising processes and mapping the benefits of a new range or kitchen from a business point of view. Salvis wishes the wedding hotel Hoher Darsberg every success and culinary treats!